Please help me understand how saving heavily and compounding returns positive growth when I see losses in my accounts? Don't the losses wipe out the power of compounding in other words? What time frame are you looking at when you mention these "losses"? Investing is a long-term endeavor. If you look at the long term trends... does that help? OP, you only saw loses last couple of weeks. Some of us lived thru loses which lasted a couple of years and I can vow the compounding power is what brought us back much stronger than before. Pick your appropriate AA and hang in there. $10,000 grows over 7 years to $20,000. $20,000 shrinks in a few weeks to $18,800. Not a dime lost. $8,800 profits. No, they do not. Losses merely reduce returns, which reduces the effect of compounding returns, but it does not "wipe out the power of compounding." Take a look at the graph below. It is of the U.S. total stock market from 2018 until the end of September, 2018. Any time the market went down, there were losses. But over the long-term, the market has gone up. In this case, the market compounded at an annual rate of 6.09% nominal, 3.82% real. In most savings accounts interest compounds daily, and is paid monthly or quarterly. Mutual funds have returns, but not interest. They compound, but sometimes it's up and sometimes down. 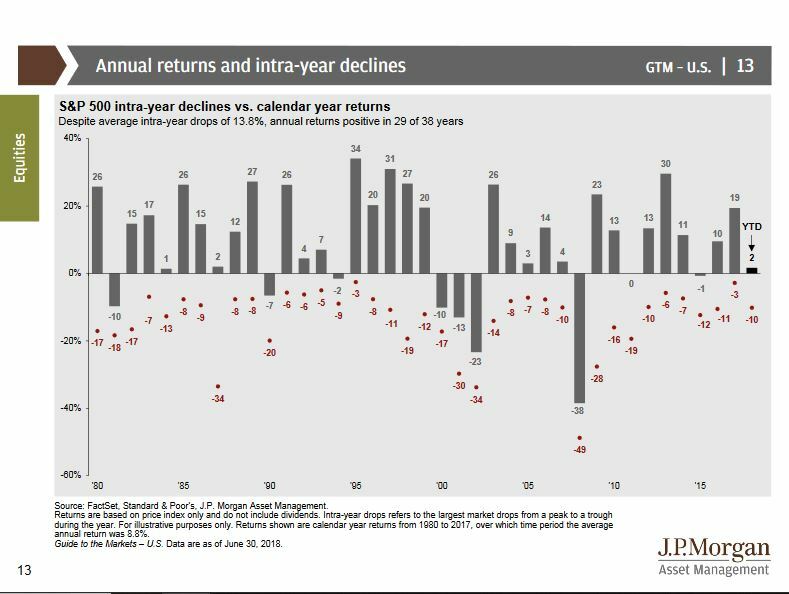 Over periods of time much longer than a day, or a month or quarter, or year, most returns have been upward. Have been does not mean the same thing as are, and even less so will be. Lest anybody misunderstand me, under adverse circumstances returns can compound negatively, but they still compound. OP: Over time we have seen most reasonable portfolios grow, and yes, next decade's growth, if any, builds upon this decade's growth. There is no guarantee at all, not over any period. Greater expected returns, a technical term meaning you shouldn't expect them in a colloquial sense, come with taking greater risks. Risk means you may not get the greater return. The power of compounding is great over time, but the power of saving heavily is also power enough to not see any losses due to poor return at the beginning. take a look at the following picture. The bars show annual gains and losses (difference from beginning of each year to end of each year) and the purple dots show intra year losses (drops from peak to trough in each year). Do you see that even though there are intra year losses every year (on average of 13.8%) returns can still be positive 76% of the time (29 out of 38 years)? coffeecup333 wrote: ↑ Please help me understand how saving heavily and compounding returns positive growth when I see losses in my accounts? Don't the losses wipe out the power of compounding in other words? I like the article. Only some of my holdings continue to raise their dividends by that much (7%), while many of them stalled and a few went bust. It's a bit idealistic, that essay, but compounding is still a beautiful thing. The article reminds me of something someone told me a long time ago, and I never forgot it. He said, "you've got to get something working for you beside yourself." I don't think I would have worded it quite that way, but he made a good point. Markets(Capital assets) and your related accounts do not compound. The gain is selling minus cost (plus dividends). Compounding magic works only in fixed income instruments like a cd. Thank you for this. Using these retirement calculators and projecting a conservative 3%-5% return rate assumes a simple return but the annual rate of return of an investment is usually the effect of a series of returns (geometric mean). So if I am saving heavily, could it be that over time that my portfolio will consist more heavily of my contributions than growth attributed to compounding? coffeecup333 wrote: ↑ Thank you for this. Using these retirement calculators and projecting a conservative 3%-5% return rate assumes a simple return but the annual rate of return of an investment is usually the effect of a series of returns (geometric mean). So if I am saving heavily, could it be that over time that my portfolio will consist more heavily of my contributions than growth attributed to compounding? Isn't it the other way around? In the beginning, our portfolios consist more heavily of our contributions, but as time and compounding go on, our portfolio growth consists more and more of compounded growth. I don’t think that’s right. Is that right? There’s definitely compounding going on in stock index funds, over time. gotester2000 wrote: ↑ Markets(Capital assets) and your related accounts do not compound. The gain is selling minus cost (plus dividends). I'm not so sure about this . . .
Dividend yields are a vital part of the long-term return generated by the stock market. In fact, since 1926 (the first year for which we have comprehensive data on the S&P 500 Index), dividends have contributed an average annual return of 4.2 percent, accounting for fully 42 percent of the stock market's annual return of 10.0 percent for the period. That "*" (i.e. "times") is where the compounding comes in. It's simple math (really a tautology), no magic involved. No, it's not right at all. It is true that returns are not "interest," but compounding is very real. The investment doesn't 'know' if it's fixed income, stocks, or something else. Here's proof: the TSM compounded at an annual nominal rate of 10.64% between 1988 and 2017 (30 years). Plug that 10.64% into a financial calculator, and you'll find that the total return is exactly the same as that of the stock market over that period, by definition. In both cases, amount is 106.12. Case 1 is compound interest, guaranteed 100%. Case 2 is CAGR - a fancy term invented to give a false sense that your investment is compounding. Markets do not compound - volatility gives gains/losses. If markets compounded at fixed rate, there will be no sequence of returns risk - you will have prior knowledge of the exact amount of your corpus growth each year. OP's original question is based on this false notion of CAGR. ^ Huh? It's okay to multiply unequal numbers! But if the rate of return and therefore the interest changed monthly, the months would be affected, leading to lower returns in year 10 as a cumulative effect-unless offset by savings. Now looking at my accounts going further back, I can see a general upward trend but the growth I am seeing may be from the savings more than the compounding. 1. IRR/XIRR: Your investment calculator is using this formula. See them in excel - see point 3. 2. Compound interest magic grows with time. Do the same with 5%,6%,7% and 10 yrs,20 yrs,30 yrs. As time grows, it becomes exponential - your interest will grow more than principal. 3. Market does not compound, only fixed income does - You may buy a stock in year 1 @ 100, in 10 yrs it may become 1000, in 20 yrs it may become 0. Stocks don't earn interest, so they don't compound in the same sense as a savings bank account. They only "compound" in a theoretical sense, by hopefully growing every year. Right - If you invest in the market index for a long term like 30 years, there is a high probability that X may become 10X. The term compounded is a misnomer to give the impression that the index returned Y% annually. In reality, it will return Z% for the entire period of 30 years. X may become X/2 after 30 years-nobody knows! Well, as PJW said early on in this thread, the compounding can be negative at times. At about 300k to 500k you'll notice the returns will exceed your contributions. Of course this depends on your savings rate. At about 500k I had to change my psychology when contributing to our portfolio. I am now buying shares of almost every employee's time in the work world. As a shareholder, my employees will work hard to make me a profit. How awesome is that? So if I own shares of Nestle and you're an employee of Nestle, I feel good knowing you're working hard to give me a fraction of Nestle's profits. This is how I think now when i contribute to our portfolio. At some point your portfolio's returns take over and your employees in portfolio will start doing the heavy lifting while in turn frees up your time to stop working so hard and do things in your life you enjoy. I buy Vanguard Total World Stock. I own a fraction of almost every public company in the world. This is correct of course, but it's worth noting for the OP that one of the first rules of the Bogleheads philosophy: "Invest you must." That is, the returns you'll get from putting money in a savings account will almost certainly be negative, because inflation will likely grow faster than your savings account. So even though that savings account will have true "compound interest" whereas the market will merely "compound," you will almost certainly lose money over time with the savings account. Another way of saying it is that yes investing has risks (many! ), but not investing has risks too. Compound interest is the addition of interest to the principal sum of a loan or deposit, or in other words, interest on interest. So, technically, stocks don't compound because stocks don't pay interest. However you may experience growth similar to compound interest investing in stocks. Have a look at the decription of the Bogleheads principle "Invest early and often"
This is a great chart! Thank you for sharing and helping put facts to feelings. Geometric means is about Arithmetic means less variance/2. See this paper for more info. Not sure of your point here. Geometric means is less than arithmetic. A good forecast of rate of return should be the geometric means, not the arithmetic means. I'm sure that most forecaster are aware of this fact. The retirement calculator rate of return forecast should have already been adjusted for this. Even if saving heavily you will come to a point that your fund growth will exceed contributions growth. At 3-5% interest rate, your fund need to be Contribution/[3-5%] before Contribution growth is less than interest growth. Ex: 500k fund with 20k contribution with an interest rate of 5%; next year will grow to 545k with 20k due to contribution and 25k due to interest growth. Thus as long as you have positive interest rate, there will be a time where contribution growth will be less than interest growth. If you are wondering when sum of heavy contributions will be worth less than compounding effect, then you need to solve the equation[c=contribution; t=time; i=interest] for t where c*((1+i)^t-1)/i - c*t*2 > 0 . Note that contribution in this equation is meaningless, thus the following results apply to any contribution level however heavy or moderate. Note that this formula use contribution at end of year. At 3%, that's 44 years or more. Meaning that you will have made more due to compounding effect than the sum of contribution after 44 years. At 5%, that's 27 years or more. At 7%, that's 20 years or more. At 10%, that's 15 years or more. But compounding is deceiptive and more powerful. At 10%, at 21 years, the compounding effect is worth 3x more than the sum of contribution. At 26 years, it's 4x more. At 29 years, it's 5x more. Note that the above calculation do not take into account of contribution growth and inflation effect. Inflation should be worse for the compounding effect than the sum of contribution effect thus more years before the break even point. There is an effect that I would call compounding that works even with stocks. Although I might not technically be correct. For example, I remember a year where I had a 20% gain in my $250k portfolio. So I "made" $50k, which was just about the same amount I was saving per year. Nice! Fast forward 15-20 years and I had another +20% gain year. But this time, my portfolio was $2.5 million. So this time, I was up $500k for the year. That's WAAYYYY more than I was saving! Maybe that's not technically the power of compounding, but I don't know what else to call it. Losses can compound too. Usually markets go up over the longterm but there is risk associated with any return investment. Stay the course. Abe mentioned interest on interest. I think of the above as a gain on a gain. Here's Investopedia's explanation of the term compounding. It doesn't rely on there being interest, or even dividends. The first example in the link shows that clearly. Compounding means this period's return (whatever period you choose) starts from the end point of the previous period's return. For companies, I don't think that "compound interest" is the right term. I think we should talk about "compound growth". When a company generates a profit, it can either pay a dividend or reinvest it or keep the cash. -- If it pays a dividend, the investor gets to decide what to do with it; he still has the same portion of the company as he bought plus something else. If that something else is an investment, he has the potential to make more profit now than he started with. The value of his holdings have grown; that growth gives him the potential for even more growth. -- If the company reinvests its profit, the investor has the same portion of the company as he bought but the company has the potential to make more profit now than when he started. Again, the value of his holdings have grown; that growth gives him the potential for even more growth. Of course, if the company looses money, all of the above must eventually stop. Also, the share price of the company at any point might not accurately reflect the real value of the company, but the value is still there. This is the clearest way I have to explain the power of compounding to people. A wealthy individual wants to give away their fortune and comes to you with two options. They can give you $5M cash today, or they can give you a penny today, 2 pennies tomorrow, 4 pennies the next day, and continue this doubling for a month (31 total days of receiving pennies). Most people assume the $5M wins out. You'll actually get a little over $10M if you take the pennies. Now you just need a way to get a 100% annual return and you too can make billions . I'm afraid that's a common misunderstanding. A corporation that pays a dividend does not increase its shareholders' wealth. Dividends come directly out of share price. If you had a stock worth $10, and it paid a dividend of $1, you would end up with a share of stock worth $9 and $1 in cash, for an unchanged total value of $10, setting aside any income tax implications. Day to day fluctuations in stock market prices can make the effect hard to see. Compounding really shows its colors when you are steadily buying and or(both) reinvesting dividends and capital gains in additional shares during a declining market. You are picking up shares at depressed prices in your mutual fund account. You just don't know it at the time. I understand that, but that has nothing to do with what I'm talking about. I'm talking about the company's profit increasing shareholder value, not the payment of a dividend. Suppose an investor buys 1% of a company at the beginning of the year. Over the course of the year, the company generates a profit, which it pays out as a dividend. At the end of the year, the investor still owns 1% of the company plus he has some cash he can use to buy more of the company or invest elsewhere. In year 2, he has the potential to make a profit on the original 1% of the company plus on whatever investment he bought with the dividends. He has not received interest, but his ability to make a profit has grown and that growth will compound as long as the company continues to make a profit. Compounding does not in any way imply growth. It's just multiplication. It's just multiplication. That is all. From that link: "....compounding refers to generating earnings from previous earnings." The company the investor owns 1% of is worth less than it was before, because its value includes its bank account, from which it paid the dividend. A company spending its cash and receiving nothing in return, as is the case with dividends, must of necessity reduce shareholders' equity. It has everything to do with what you're talking about. What time frame? I believe Albert Einstein had a legendary quote regarding compounding. Again, this is a misunderstanding about the effects of a dividend. You, the recipient of the dividend, did not "increase your ability to make a profit" because the company who issued it is now worth less. Number of shares doesn't = "ability to make a profit"
Just because you got to keep the same number of shares in company A and can now buy some of company B doesn't mean your capacity for profit has changed. Dividends are not interest. You didn't gain or compound anything. If anything, you lost money due to taxes. I believe Albert Einstein [insert name here] had a legendary quote regarding compounding. "Compounding magic works only in fixed income instruments like a cd." How many factories will they have at year 40? Regarding this original question: "Please help me understand how saving heavily and compounding returns positive growth when I see losses in my accounts? Don't the losses wipe out the power of compounding in other words?" The price of the stock at any point in time, has nothing to do with the profit Coke is making or the number of factories it is building. Cokes profits keep right on compounding, and your share price/value will track profits over the LONG term. Good example. Your last point over the "LONG" term is spot on. Warren Buffett, in discussing the volatility, has said that nothing has really changed in business. Businesses are the same as the day before. Over time the stock will reflect the value of the business. In the short term the stock market is a voting machine. Over the long term it is a weighing machine. I guess you can say that short term investing is a oxymoron. My posts above were NOT about what happens when a company pays a dividend. My posts were about what happens when a company makes a profit. When a company makes a profit, its investors get more resources with which to make profits in the future. This is compound growth, not compound interest. A company paying a dividend does not cause investors to get more resources; dividends are not some kind of magic free money. A company making a profit DOES cause investors to get more resources. I hope that clarifies what I said for you.